Uranus is a gas giant planet like Neptune. In terms of composition, they are very similar. Voyager 2 did flyby of Uranus in 1986. This spacecraft promptly sent the images back to Earth before moving on. In these photos, you can see its 9 bright rings, bluish glow and an unusual tilt. Other than NASA’s Voyager 2, what we know of Uranus is all by telescope. 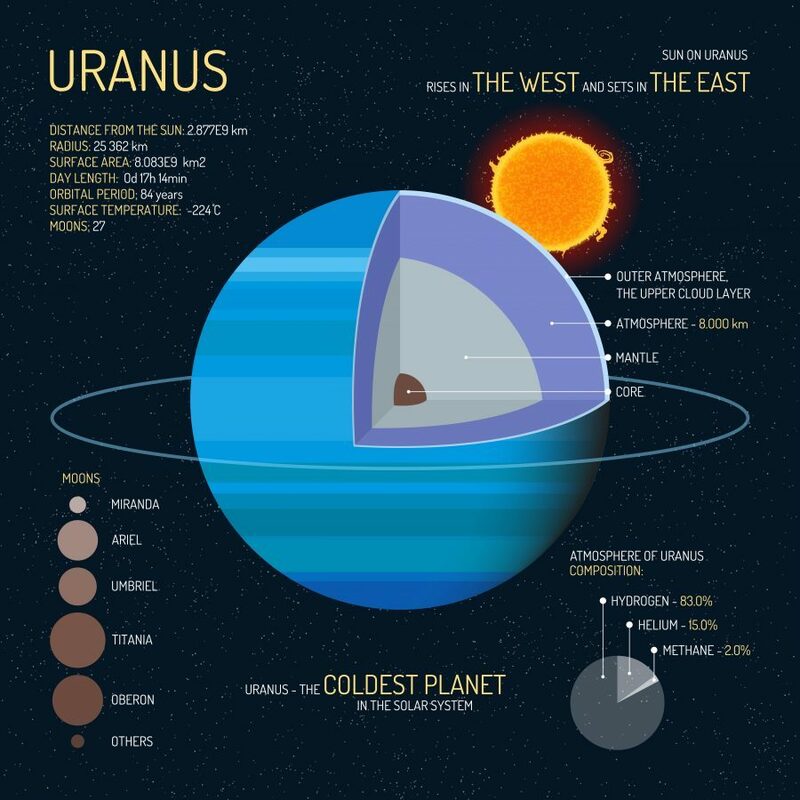 So what do we know about Uranus? Uranus is cold because it’s the seventh planet away from the sun. For atmospheric temperature, it’s a minimum of -224°C. Because of its distance to the sun, the length of a year on Uranus is equivalent to roughly 84 Earth years. 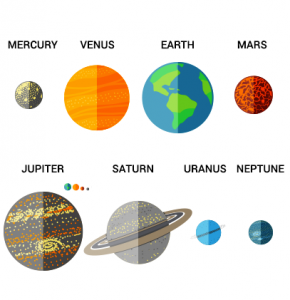 In terms of radius, it’s the third largest in our solar system. But for mass, it’s the fourth largest because it’s mostly composed of gases. All the gas giants in the solar system have rings. Most notable, Saturn’s rings are thick and made of water and ice. But Uranus consist of 9 bright rings. It also has fainter rings surrounding its mass. Its ring system have both inner and outer rings. They even incorporate 11 of its moons as part of the structure. 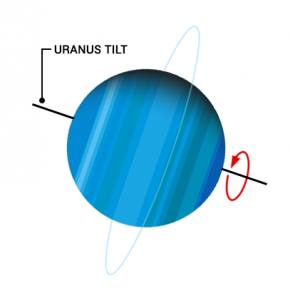 Out of all the planets in our solar system, the most unusual tilt goes to Uranus. This is because it’s tilted at 98 degrees spinning on its side. Whereas Earth is tilted at roughly 23.5° on its axis. Because of its unusual tilt, one of its hemispheres are pointing at the sun. When you incorporate revolutions, it means seasons are right roughly 21 years long. We don’t know how the planet could’ve tilted nearly perpendicular to the sun. But it’s believed to have been knocked by another planet. Uranus has 27 moons but only 5 hold enough mass to call them ‘major’. 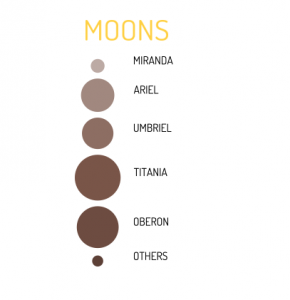 But its 5 major moons includes Umbriel, Miranda, Ariel, Titania and Oberon. All 27 moons are all named after characters from William Shakespeare and Alexander Pope. 11 of the its inner moons share similar characteristics to its rings. They’re small and faint in appearance. Finally the remaining 9 moons of Uranus are irregular in shape. For example, Francisco, Ferdinand and Prospero are names of the irregular moons. 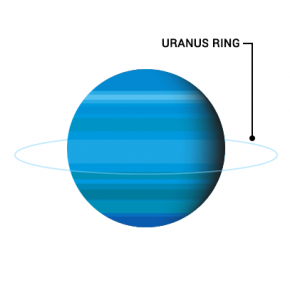 One of the things that stands out most for Uranus is its green-blue appearance. But it’s not blue because of surface water. 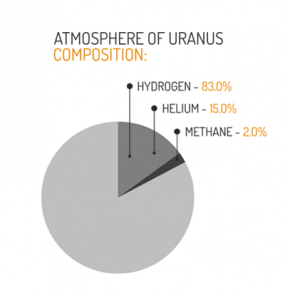 Uranus is blue because of methane gas in its atmosphere. Methane gas is known to absorb red light and strongly reflect blue. It’s mostly ices in the mantle like water, methane and ammonium. But its atmosphere is mostly hydrogen (83%), helium (15%) and methane.